WHAT IS ONLINE ADVERTISING DISCREPANCY? It is the difference between numbers reported by a media owner/publisher and a third-party ad server which will generally differ between the publisher and the 3rd party ad server as the technology used is different at both end. Discrepancy to occur is common when you are playing with Network (Internet), we were already trying to figure it out that what is the major reason for discrepancies in Web Advertising and then we came up with the same questions in Mobile Advertising now. Discrepancy is a big problem that online advertising is going through from initial stage and is still being researched to lower the numbers as much as possible as it causes issues with reporting, billing, and of course overall performance. The more or less the reason behind the discrepancy is same in mobile advertising as it was for web advertising. DIFFERENCE IN TRACKING METHOD – Generally all the third party tracking is done by a pixel firing once the landing page has fully rendered while the ad serving platforms track clicks when the user clicks on the banner irrespective of the outcome of the action which will for sure create a difference in the numbers at the end. CACHE BUSTING – We all know that an ad can be served or reused using the cache so as to save that, a cache buster (e.g. a random number) which prevents the reuse would be implemented with the 3rd party tag to save the discrepancy. TIME ZONE DIFFERENCE – Different vendors may provide reports in different time zones. This is especially problematic with short campaigns and to avoid this problem it is important to make sure you’re comparing these figures within the same time zone. TERMINOLOGY – The terminology used during the approval of the campaign should be noticed so that it is same and no confusion is formed, the metrics used may have a slight difference with the meaning for different parties which may causes inconsistency in report thus discrepancy can occur, best example: Impressions can be counted differently by the parties involved like impressions count on ad call or impression count on server call or impression count on view only, etc. CONNECTION PROBLEM – As mobile device not being a fixed connection , connectivity can be an issue at times as mobile may get out of network range as the page is about to load, in this scenario ad server may register an impression but site does not. THIRD PARTY TAGS – The 3rd party tags should be compatible with the publisher’s SDK (software development kits), if not applicable the ad may break and may show blank impressions resulting in discrepancies. As this is has become a major concern IAB has started to give a deeper attention towards it and decided to form a proper guidelines which when followed may lead to minimize the discrepancy to quite some extent. They have already started this with initiatives like guidelines for MRAID, Mobile Web Measurement Guidelines and the Mobile Phone Creative Guidelines. 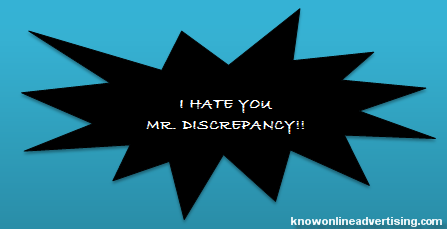 Steps or Basic checks that can be useful to reduce discrepancies or say HOW CAN WE REDUCE DISCREPANCY? Failing to copy and paste the entire 3rd party tag. Not implementing the correct cachebuster or timestamp. Difference between campaign run dates from 3rd party to publisher. HEAVY CREATIVES – Please try to avoid using heavy creative (heavy rich media ads) as using heavy assets will increase the load time of ad and website which may also result into discrepancy. Follow the guidelines provided by IAB. HEAVY WEBPAGES – The way heavy creative leads to discrepancy, similarly heavy webpages can also as ads have related effects of webpage loading time. So having a less page weight will also reduce the discrepancy, keep an eye on the webpage loading time also. TESTING – Most important check that can play a main role in saving discrepancy is proper testing. A Comprehensive pre-launch testing, in conjunction with all tracking partners, to check for discrepancies before the campaign goes live will be great, also checks should be performed across a range of different mobile devices, and mobile ad formats, that represent the current mobile landscape. COMPATIBILITY – The compatibility of the advertiser’s third party tags with the publisher/ Ad Networks or Real time bidding platform server should always be checked beforehand. TRUSTED AD SERVERS – Make use of the trusted and known ad servers only. CHECK THE TIMEZONE OF THE REPORTS – As discussed earlier difference in time zone affects in data reporting which may lead to discrepancy so keep a check on the time zone of the different reports, it should always be same. CLEAR COMMUNICATION b/w ALL PARTIES – Make sure that metrics are being defined the same by all parties involved, and therefore reporting is accurate. REDIRECTION OF AD CALLS – Try to ignore more number of redirections as Redirecting Ad calls can also be a cause for discrepancy as these ad calls are being called using a 302 redirect. If there are characters inside the URL chain that the browser does not understand the URL might not be able to resolve to the correct location. There is a limitation in Internet Explorer that limits any URL to 2083 characters, by adding more and more URLS to a redirect chain may cause the URL to exceed this character limitation and there for break and redirecting will not be able to follow through. Each URL in the chain gets fired one after the other in a chain, and each URL gets parsed and then will continue on to the next URL and so on. If the user closes the browser window while this process is running, the redirecting will stop and not all parties will count. *So try avoiding redirection of ad calls! charming inspiring collection.lovely created designs here!Many thanks for sharing. What’s the best way to lower banner ad impression discrepancy?